Hey there folks I just have a quick question regarding depictions of Saint George and the dragon. In virtually all depictions his horse is depicted as rearing yet in some he still has his lance couched, could someone deliver and kind of blow with a couched lance if your horse is rearing? Should I see some sort of technique behind this or is this just the artistic liberty of the artist? I believe this is just artistic convention to show horses running. I have heard that it wasn't really until the late 1800's or early 1900's that artistic accuracy for a horse in motion was even a thing. I think it had to do with photography allowing the motion to be broken apart so that an artist could accurately draw the leg placement in mid-run. Before that they just drew the legs like you have shown because either they thought that was accurate or it was close enough and portrayed motion. the first two pics are fine, perfectly possible although pic one shows a moment just after impact. 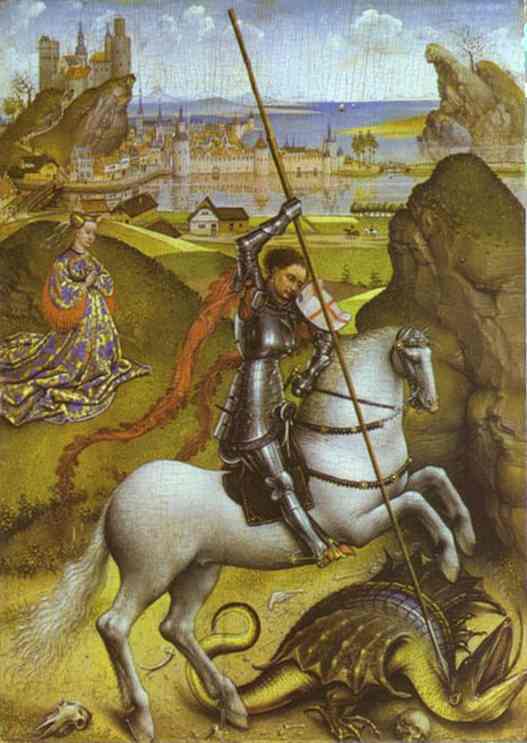 The lance is already in the dragons mouth, the horse has halted and is doing a little step up and over. But if St Georges moves him forwards he'll have problems and will have to quickly disengage his lance from the shield and do some clever re-adjusting of his grip. The 2nd is even more possible. But in a rear the only way you could deliver a truly couched blow is as the horse is coming out the movement and so you have some forward movement. In a couch the lance is held tight and is effectively 'locked' into your body and is therefore an extension of the horse itself so if the horse is moving up and away, so is the lance. A blow as the horse rears up and away from the target is not impossible but very much weaker as you'd not be using the weight and momentum of the horse, you'd have to pretty much come out of the couch and use a thrust, not particularly effective or recommended. 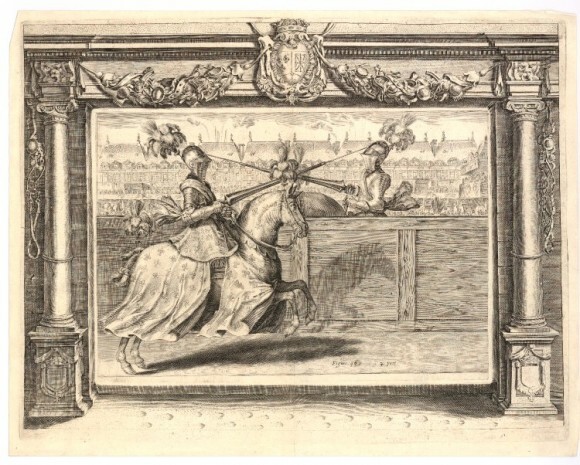 The jousting pic of Henri II getting injured is too fanciful to be taken as anything to drawn and conclusions from and the other multiple pics are not really rears, they are engaging at speed. To be truly rearing the horses center of gravity needs to be a little further back than those poses. Also take into account that image composition can be just as important to the artist as anatomic correctness or accurately capturing motion. Rearing horse is a great way to get a diagonal flow in an image. I interpret it as showing the horse and rider recoiling from the impact. As long as it is a wooden lance, it wouldn't stand the force of an impact as strong to recoil a horse. I was able to see the jousting at St. Wendel in 2012 where they used lances made of grown wood and I was surprised to see them brake like toothpicks upon impact with no effect on rider or horse at all. If the lance isn't suspended by the breastplate, I imagine it would rather ripp your arm off than bother the horse. I still believe that it's artistic convention to visually show the force of the charge. If the horses were depicted in a more natural pose then the scene would have no energy and appear static. Furthermore, the artists of the time had no cameras and could not depict a true "still-frame" of what a horse looked like at the moment of impact so they had to develop some conventions. Yes, it seems to be an exaggeration, although I did see many horses at St. Wendel stumble back or to the side slightly after an impact. Recoil was probably the incorrect word to get across my meaning. What I meant was that the pose simultaneously conveys both the horse driving itself forward with its back legs and receiving the hard impact. This convention of the "rearing" horse is at least from the 13th century, and probably earlier. Finally, here's a similar depiction of a "rearing" horse before impact. Sorry if that's too many pictures. All images from manuscriptminiatures.com. Essentially I believe that it's an artistic convention developed to show the horses driving themselves forward with their legs, rather than rearing up. I don't think it has anything to do with any special technique. Hmm that could indeed be the case. However I can't help but notice the horses in the last picture lowered their heads just before the impact. I wonder why that might be. The lances broke at St Wendel (I was marshalling on the ground and two of the armours were mine) as they were the weakest part of the set up. This is due to the use of the arret on the breastplate and the graper on the lance, locking the two together. On impact something has to give and the wooden lance was never going to be stronger than the horse or rider. That last picture,at least in my opinion,illustrates the initial charge rather than just before impact. Therefore that one could actually show a slight rearing before the charge.I have also seen the horses of modern jousters somewhat rear at take off. Coming back to the initial question, if there is a technique behind the depictions of knights with couched lances on rearing horses. I doubt that. I think its either the way of the artist to make the portrayed person looking damn cool on a horse, like on the depictions of the initial post by Pieter B. or the way you paint a horse in motion with only your own eyes to analyse the exact position of the horses legs. Or both. Were the lances even stronger and was it possible that the horse gets distracted enough by the impact to rear up? I still don't believe there is a way the impact can stop the horse from a gallop into rearing up, or even lift it that much that it can be seen as a "rearing" in motion, before lance or armour breaks. It's a medieval artistic stylization based upon observation of horses in combat. Nothing too complicated about that. I note, though, that it's a fairly common reaction for horses, when encountering snakes or other wriggly creatures, to rear up in their initial surprise. Perhaps, considering dragons are a form of 'serpent', the sticking the dragon with the lance while the horse rears is a reflection of this? I see. I suppose it was just indeed the choice of the artist then. My horse, a more experienced jouster than I am, often sits back a bit when starting a run, just to give himself a bit more go. I think he's also showing and reminding me just how keen and good he is. It's a great feeling. His front legs certainly kick out on the first stride but it's not a rear, just the equivelant of us taking a step back when making a big jump. Right, until the modern era we didn't actually completely understand the breakdown of horse movement. The event Joel is referring to is known as the Sallie Gardner experiment. So the fact that a medieval artist might not correctly capture such a high-speed moment isn't too far-fetched. In some cases it might not even be artistic license so much as limited understanding. Not what I said, sorry if that's what came over. Its not a design thing (and I'm not going to rant on about my thoughts on 'design' in the pre industrial world') but the lance simply is the weakest point, plain and simple. All that mass and force has to give somewhere and its usually in the lance unless something is wrong elsewhere. There is undoubtedly a paper in the fact that what you see in many depictions on jousting strikes is the lance breaking into three chunks and this was also seen at St Wendel. Judging by depictions and sockets of surviving lance tips war lances tend to be thinner and more slender. Out of all the many factors in play when using a lance in proper lethal combat the shape and strength of the lance is probably not that high up in deciding what happens. It certainly doesn't want to be so thin it just snaps like a toothpick but it is only a delivery system for the lance tip and the force that backs it up. That clears up something. I must admit I know very little on horse movement patterns but I can imagine lifting your front legs to start movement from standing still can be beneficial. You seem quite knowledgeable on the subject so I have a question for you. Is there some sort of agreement on how a lance was used versus infantry? 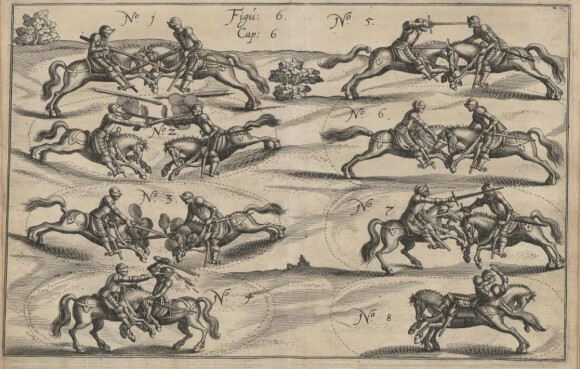 If you had a cavalry charge 2 or 3 ranks deep all armed with lances, would the cavalry on the first rank target the front rank of the enemy infantry with their lance or the 3rd rank of the enemy infantry? Oh and when taking on infantry did they target any specific area of the body?